Here at Fellowship Baptist Church, Burford, we take marriage very seriously. Marriage is the greatest expression of love in a human relationship. 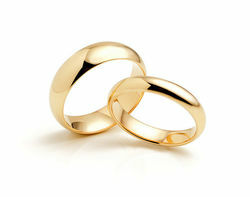 Marriage is a sacred act, which means that it is holy before God. God is the One who created marriage in the first place. It is His design. Here at Fellowship, we believe that marriage is only between a man and a woman and that these two individuals are made one in marriage the way that God has designed. We also believe that marriage is a Covenant and not a Contract. In other words, anyone can sign a contract...where they commit to doing their part to fulfill their obligations. But not everyone can sign a covenant. A covenant is determined by knowing that you have God as the witness. And that you covenant before God to fulfill your marriage vows. or another approved pastor prior to the wedding date. 2. The couple read a book on marriage as directed by the pastor. 3. A rehearsal be held a day or two before the wedding with the entire wedding party. It is preferred that the church receive at least a 3-month notice prior to the set wedding date...this notice must be given through the pastor. Weddings and rehearsals are not to be scheduled on Easter weekend, Thanksgiving, Christmas Eve, Christmas Day, New Year's Eve and New Year's Day and all other statutory holidays. Marital banns are available to couples who are actively serving within a Fellowship Baptist Church. Please speak with Pastor David to see if this is an option for you. ​May God bless you and lead you in this most important life decision.